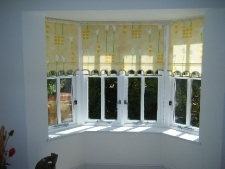 Bubbles Blinds offers sidewinder or spring loaded roller blinds in a vast array of fabrics, colours, shades and patterns. There is also a great number of bottom finishes, decorative braids, poles and beading etc to choose from. Roller blinds are now available in the "Perfect Fit" system making them more versatile then ever.